“Breaking the Silence” by Diamante Lavendar is a story about abuse – physical, emotional and sexual, that started when Joan Eastman was 2 years-old. This continued abuse had a negative impact on the rest of her life. How does a child of two explain what is happening to her when she can’t understand it herself? The author does an excellent job of describing dysfunctional families, self-hatred, and despair. It is not written to gain sympathy, but provides hope and resilience during those times. Joan’s spiral downward included violence, substance abuse, self-injury, and thoughts of suicide. Regardless of her situations, she begins to understand herself more with the help of spiritual awareness, which was always there to guide her. Haven’t once been pregnant and losing a baby, Joan finds herself pregnant again with a loving, supportive husband. But, thoughts from her previous pregnancy nag her and she is determined to keep this baby full term, and love it with the love she was never given. It takes an exceptional writer to take tragic events like these and make the story inspirational and full of hope. The story will leave readers experiencing many emotions, one of which is wonder as to how one person could handle everything she went through. For some who may have had the same experiences, it will help explain a lot of what they are feeling and will hopefully turn some of the negativity into positive change. The cover of the book is well represented, the writing easy to read and follow. Characters were well developed and readers will relate to the situations, or know of someone who experienced them. One aspect of the book that was helpful was the “Life Lessons” at the end of each chapter. Although the author did address spiritually and God, it was not so much that it would turn some readers off. I believe the point is we should find a higher power, of whatever we choose, to help us keep going. 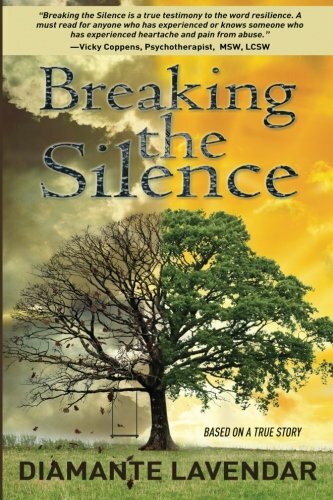 Overall “Breaking the Silence” by Diamante Lavendar does a great job in capturing readers attention with details based on the author’s own experiences, she does not gloss over the facts, yet she provides great insight and encouragement.